File them with the power suits and American flag pins. These days it seems as if every presidential wannabe has to pen a campaign book. Whether it’s before an official announcement to run, during the race itself, or in the period between working for one office and switching to another, a hardcover bearing a politician’s name is a growing status symbol among presidential hopefuls and everything from the timing of the release, to the topic, to the title is strategic. Often times a candidate’s book outlines the policy he or she envisions for America. Mitt Romney’s 2010 “No Apologies”was an example of this. It made the New York Times best-seller list, though it later was reported that sales were boosted by Romney’s deal with institutions to speak for free if they purchased the equivalent of $25,000 to $50,000 of his book. Other times, the books come in the form of a memoir, such as Democratic front-runner Hillary Clinton’s book “Hard Choices,” which was released in April of this year and sold 280,000 copies as of July. It netted the former Secretary of State a $14 million advance. And often a book lies somewhere in between the two. But the one thing they all seem to have in common, is that publishing them is tactical. It’s no coincidence that GOP presidential candidates Jeb Bush and Donald Trump released books just this week. And Ben Carson, who released his book, “A More Perfect Union” in May, “suspended” his campaign this week to go on a 26-day countrywide book tour. With just under three months to go until the Iowa Caucuses, Bush released an e-book Monday entitled “Reply-All.” It’s a compilation of un-altered emails he sent back and forth during his time as governor of Florida. 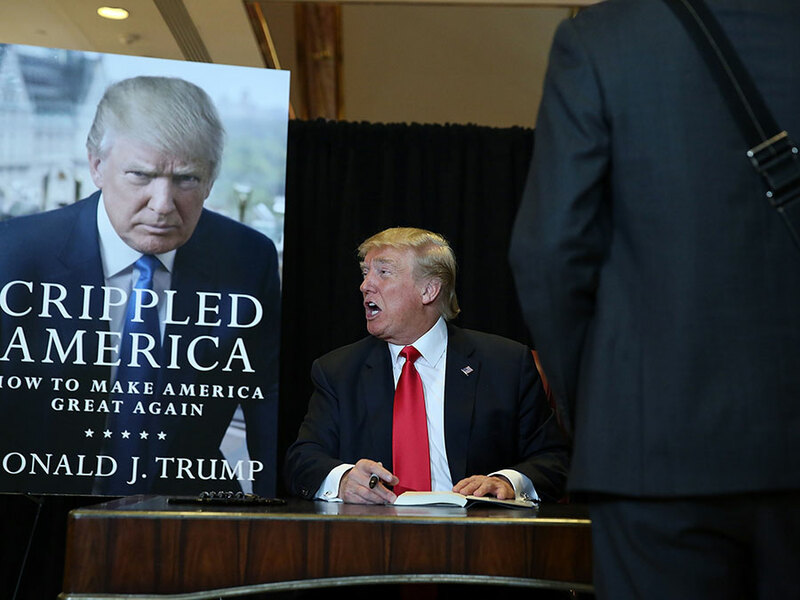 Donald Trump’s book, “Crippled America,” was released Tuesday. It aims to clarify some of the candidate’s previously blurry policy agenda on issues such as jobs and the economy. In Jeb’s case, Fehrnstrom said the e-book is meant to prove to people that Bush is a proven leader—and one that makes time for his constituents—as shown by the many email interactions he has directly with constituents. The book’s release is also perfectly timed, as Bush continues to lag in the polls after a prettydisappointing performance in the GOP’s latest debate. Some critics view the e-book as a desperate attempt to revive Bush’s struggling campaign. It’s not just enough for a candidate to write a policy book, or to time it to come out at the most opportune moment, sales from the publications are also key to keeping some campaigns afloat. The average number of sales for these political novels according to data compiled by the Nielsen Bookscan are in the tens of thousands. Although, many have sold fewer. A few politicians have been able to net big sales from their books, however, and garner some pretty impressive advances. Carson’s most recent book is a perfect example. More than 362,800 copies of the book were sold by July. For comparison, Ted Cruz’s book “A Time for Truth: Reigniting the Promise of America” sold only 12,000 copies by July since its release in June. Cruz received a $1.5 million advance. As Jason Pinter, founder and publisher of Polis Books, wrote for the New Republic, Cruz spent $122,000 of his own money to buy copies of his novel. He then signed copies and sold them on his campaign website for $85 each, a 303 percent mark-up from its full retail price. This tactic provides easy cash at hand, especially for a candidate like Trump, who is foregoing donations from Super PACs and big donors, writing a book offers a funding loophole. Also, releasing a book allows candidates to travel the country under the auspices of promoting their book while letting their publisher’s foot the bill—something Carson is currently being chastised for.